Leon Frazer & Associates lost its only remaining namesake on Feb. 6 when George Frazer passed away. The Canadian investing community lost a champion. George Frazer was a man who understood how to make his clients a dependable return. With little fanfare, he turned the emotional casino called the stock market into a machine as predictable as a fine Swiss watch. In today’s fast paced financial world investors change direction often, sometimes multiple times a day, and for many different reasons. They sometimes seem directionless, like a boat set adrift on a blustery day. George Frazer had a strong compass, tested over many years, which always led him on the truest course — aligning his interests 100% in the same direction as his clients. His individual decisions were not always right, but the motivation for each decision was unquestionable. Few in this industry possess a compass as pure as George and that is a special thing. He leaves behind an investing legacy that is virtually unparalleled. 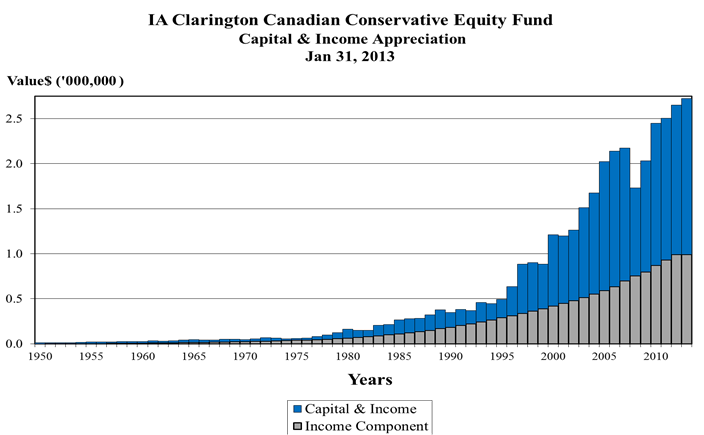 The IA Clarington Canadian Conservative Equity Fund has had a few different names over its 62-year lifespan, but it has always had George as its lead manager. George Frazer compounded a 9%+ return for his clients (net of fees) for 62 straight years, making clients almost 210 times their initial investment over that span. How did he do this? Was he a Magician? A Genius? A Guru? No. George’s face would look like he bit into a lemon if he heard you call him any of those things. He was an ever curious, always observant learner who had a deft ability to evaluate the motivations of others. He used the same principle that he, himself followed, earning the trust of his clients. Take their money and give it to management teams whose interests were aligned with making their shareholders a profit. Focus on those companies that display their growing profitability with the signpost of a tangible, consistently growing dividend and let them do their work. There were companies that broke this trust over the years, lessons were learned, and George’s discipline got stronger – and those companies were never forgiven. The strategy works incredibly well, but few have the discipline to execute it at all times. That is why George was so unique. In his later years, George took to shaping the culture of the firm so it could continue on its noble path. Over the past seven years, I was fortunate enough to learn George’s elegantly simple strategy. I saw first hand how difficult it can be to execute the strategy in both a frothy and a panic-stricken market. George’s constant optimism, and unwavering belief in what is ultimately true, will forever shape my thoughts as I attempt to be a part of continuing our firm’s legacy. We are now entrusted with over $2 billion Canadian dollars, dollars that were earned by hardworking clients. Many people in our industry have long forgotten this moral contract. Leon Frazer & Associates will continue to honour our clients’ with everything we do. That, and that alone, will make us successful in ways that accounting statements cannot measure. The idea is that we continue to build one side of the mountain. There will always be slips along the way in the share prices, but the dividend income, shown by the grey line, never falters. It keeps the blue “total” lines climbing. Whenever George was asked about the market by a nervous or exuberant client he would have the same response, “How’s your income?” because he knew that patiently watching that income grow was the key to the client’s ultimate success, and emotions, both positive and negative, were their greatest enemy. I will miss him. He changed my life.